“Frailty needs to be recognised and treated as a long-term condition, which can be managed – but we need to arm ourselves with a better understanding and the language to treat it effectively” said Dr. Diarmuid O’Shea, Consultant Geriatrician, St. Vincent’s University Hospital at the opening of ‘The Dynamics of Quality Care in Older People’ the annual study day for health professionals held today (Friday 8th February 2019). “Ten days of confined bed rest in hospital is the equivalent of 10 years ageing in the muscles of people over 80 – that’s approximately 10% loss of aerobic capacity and 14% loss of muscle strength. It is essential that we provide pathways of care which ensure that older people can get home as quickly as possible or stay home – during and after a health event – back to the familiarity of their lives, their families and their communities. There is no place like home to help you recover” O’Shea said. “We need to change our mind sets and view healthy ageing as an investment – not a cost – where the first step of care is prevention and education at community level. We also need to ensure that our hospitals have the capacity, expertise and resources to intervene, diagnose and manage these patients early so when they do present themselves in ED that we can provide them with a comprehensive geriatric assessment – which determines their medical, psychological and functional capabilities, and gets the recovery plan up and running early – before any admission to hospital is necessary”. “We know that populations are getting older overall. The number of people aged 60 years or older will rise from 900 million to 2 billion between 2015 and 2050 (moving from 12% to 22% of the total global population). In Ireland people over 60 years – 12.7% of the population – use 53% of inpatient bed days and people over 85 yrs – 1.4% of the population – use 13.5% of the beds. If we had more health services and support at community level that’s a lot of bed days saved – not to mention the significant health benefits to the patient” said O’Shea. 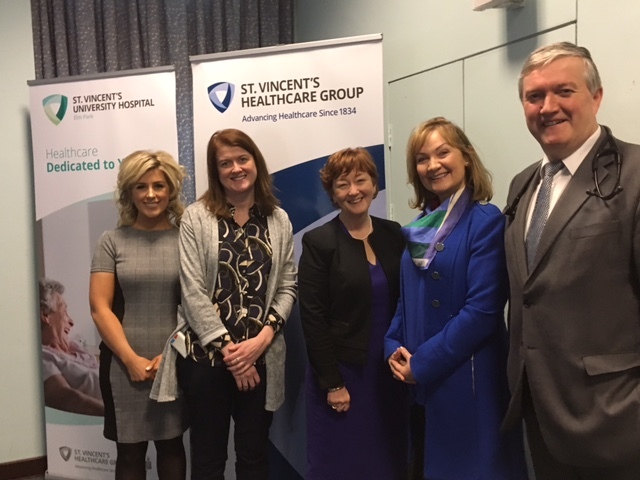 ‘The Dynamics of Quality Care in Older People’ now in its 15th year is delivered by the Department of Geriatric Medicine at St. Vincent’s University Hospital. Developed by Ms. Imelda Noone, Advanced Nurse Practitioner in Stroke, the meeting was attended by over 100 health professionals including nursing staff, allied health professionals, healthcare assistants and representatives from local nursing homes. It continues to grow in popularity and provides a great opportunity for colleagues to meet and network, as well as get updates on a range of important topics and how we can continue to improve the quality of care we deliver to the older people who live in our community. This year’s attendees heard presentations on topics including dementia care, Parkinson’s disease and its management, information sharing between nursing homes and hospitals. – Dr. Graham Hughes spoke about Parkinson’s Disease and its management. – The opening address by Dr. Diarmuid O ‘Shea gave an update on Frailty and the progress been made by the National Frailty Education Programme in addressing how, through interdisciplinary education we can all improve our knowledge and understanding this emerging chronic condition – and subsequently improve patient care and outcomes. – Ms. Imelda Noone, Advanced Nurse Practitioner in Stroke, and meeting coordinator, Dr. Morgan Crowe, Consultant Geriatrician and Ms. Sarah McNally, Clinical Specialist Occupational Therapist in Stroke will chaired the meeting. Pictured (from l-r) at the annual study day were: Sarah Mc Nally, Clinical Specialist OT in Stroke, Marykate Meagher, Clinical Nurse Specialist in Stroke, Norma Sheehan, Director of Nursing, St.Josephs Nursing Home, Shankill, Imelda Noone, Advanced Nurse Practitioner in Stroke, Diarmuid O’Shea, Consultant Physician in Geriatric Medicine.